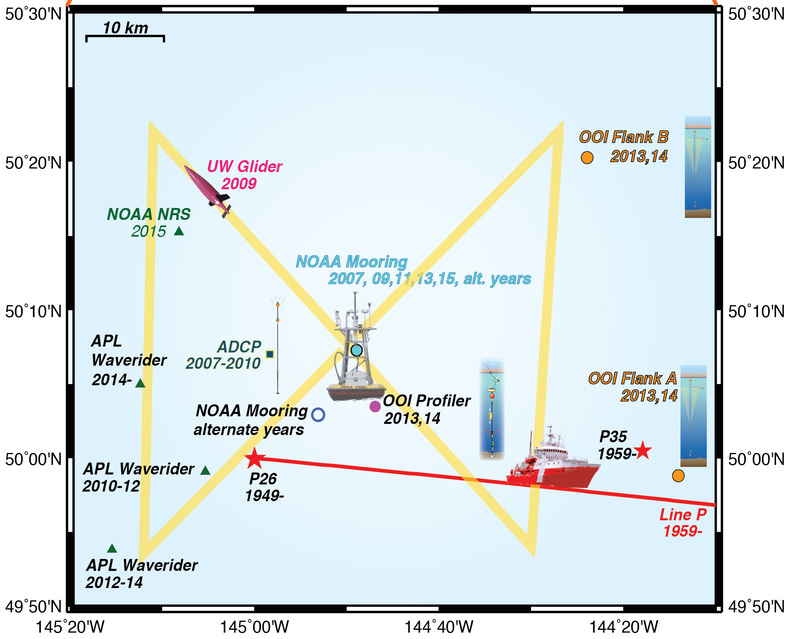 Ocean observations in the Papa region, including the NOAA Mooring, and new OOI observing stations. Ocean Station Papa (50°N, 145°W) is an important site for continued monitoring of ocean climate, because it has one of the oldest oceanic time series data records. Beginning in December 1949, Ocean Station P was occupied by a U.S. Weather Ship operated through the Coast Guard by the U.S. Weather Bureau. In December 1950, a Canadian Weather Ship began occupying the site, and several years later, oceanographic measurements began to be routinely made. With the advent of the satellite era, the Weather Ship programs were discontinued, and after August 1981, shipboard measurements along Line P conducted by the Canadian Department of Fisheries and Oceans (DFO) were limited to three to six times per year. Visit the Line-P Program website for further information. In 1997-99 a NOAA PMEL surface mooring was deployed at station Papa as part of the Nation Ocean Partnership Program (NOPP). In October 1999, the NOPP sponsored Oceanographic-Systems for Chemical, Optical, and Physical Experiments (OSCOPE ) surface mooring was deployed. Due to a faulty chain, the OSCOPE buoy broke from its line after just one month, and was recovered in early January 2000. 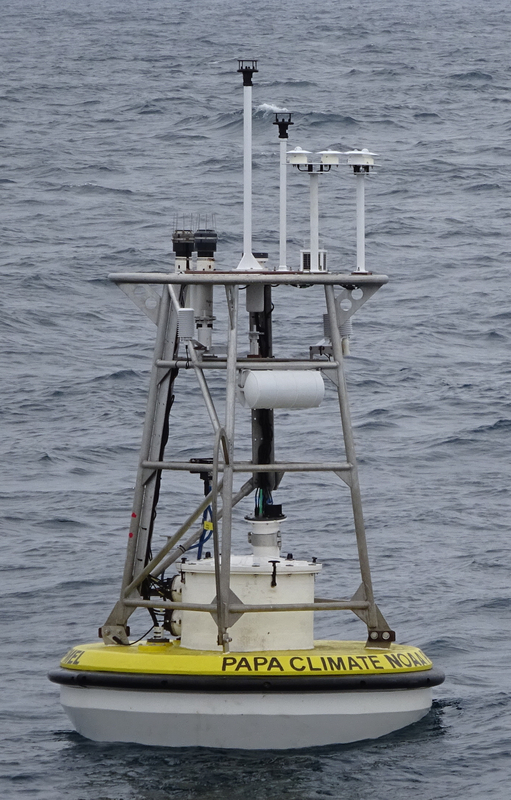 In June 2007, a NOAA surface mooring time series was initiated at Station Papa with funding from an NSF grant to Dr. Steve Emerson (University of Washington) to study the North Pacific Carbon Cycle. At the conclusion of the NSF process study in 2009, NOAA's Office of Climate Observations took over support of the OCS mooring. The Canadian Department of Fisheries and Oceans Line-P program continues to provide ship time for annual mooring maintenance. The OCS mooring is nominally located at 50.1°N, 144.9°W. OCS and partner study initiatives near Ocean Station Papa as of 2016. With the ongoing DFO Line-P cruises and NOAA OCS surface mooring providing the backbone observations at this important historical site, Station Papa continues to be a favorite location for process studies. In recent years the station has been enhanced with a glider, subsurface ADCP moorings, profiling floats, a noise reference station mooring, and a wave measuring buoy. Many of these observations are still underway. Beginning in 2014, the NSF Ocean Observing Initiative (OOI) enhanced Station Papa with an array of subsurface moorings, making it one of four Global Nodes. See the Other Research at Ocean Station Papa page for more information about these other studies.